I love bugs. 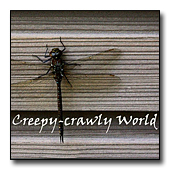 Here's a video sporting little bug photography and a tiny bit of animation, my tribute to Halloween month with the creepers and the crawlers that inhabit my garden. I welcome them all—well almost all. Watch it full screen to catch all the creepy! Warning! If you are squeamish about insects and spiders, don't watch.